Nutrition for the vegetative growth phase. 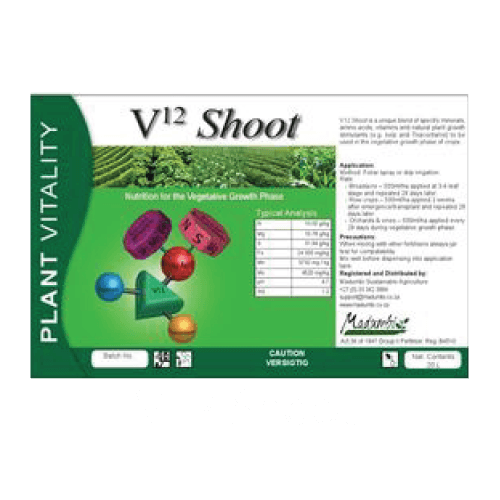 V12 Shoot is a unique blend of specific minerals, amino acids, vitamins and natural plant growth stimulants (e.g. kelp and Triacontanol) to be used in the vegetative growth phase of crops. Foliar spray or drip irrigation. Row crops (maize, wheat etc.) – 500 ml/ ha applied at 3-4 leaf stage and repeated 28 days later. Veg & small fruit – 500 ml/ha applied 2 weeks after emergence/transplant and repeated 28 days later. Orchards & vines – 500 ml/ha applied every 28 days during vegetative growth phase. Supports vegetative growth and photosynthesis. Improves chlorophyll levels and photosynthesis. Optimises production capacity of the crop. Biostimulation of the initial growth phase – germination or bud burst. Magnesium and iron in V12 Shoot support photosynthesis during vegetative growth.